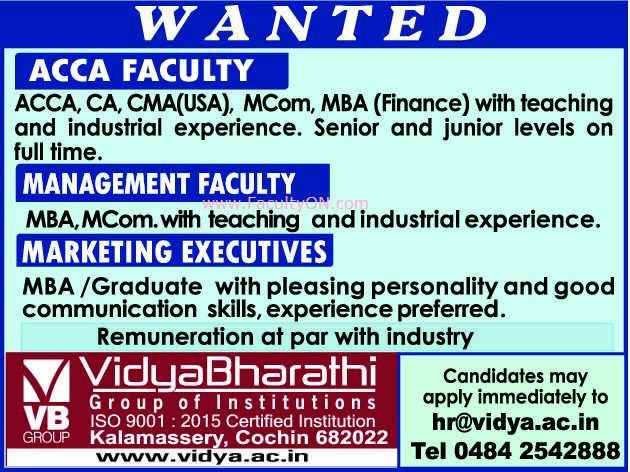 VidyaBharathi Group of Institutions, Cochin has advertised for recruitment of Teaching Faculty jobs vacancies. Interested and eligible job aspirants are requested to apply immediately from 28th November 2018. Check out further more details below. About College: VidyaBharathi Group of Institutions offers ACCA course of U.K - A potential course offering a rewarding career in accountancy, audit, finance, management and taxation across the globe. ACCA is globally accepted as the most preferred accountancy qualification by the employers. Established in 2000, VidyaBharathi Group of Institutions is registered under the Travancore-Cochin Literary, Scientific and Charitable Societies Act 1955.